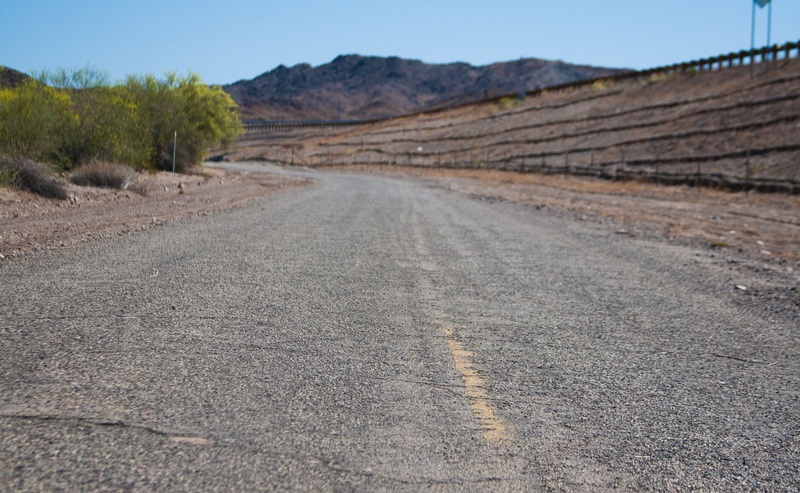 With all the recent publicity surrounding La Paz County finances, employee furloughs, layoffs, lack of funds, why is La Paz County busy building a Road To Nowhere? For the past week or so La Paz County workers and construction vehicles have been busy upriver near the public launch ramp depositing road base and grading the upper end of Cienega Springs Road just below SR 95. 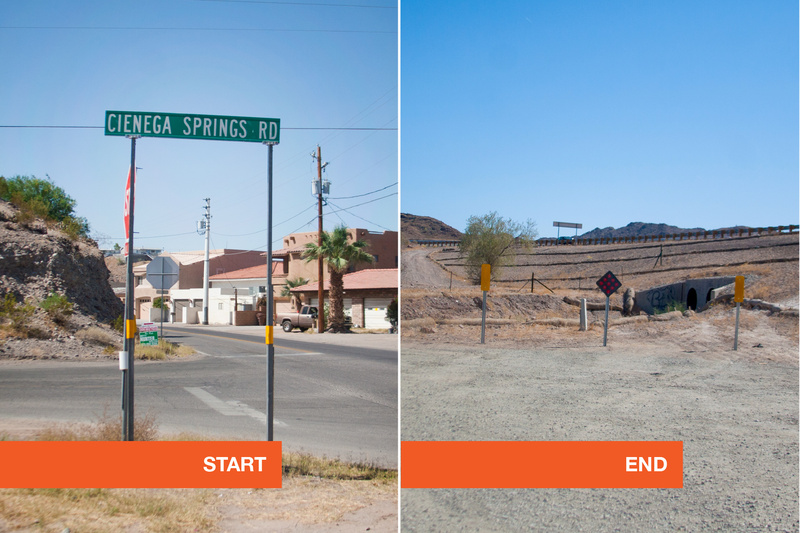 That’s all well and good, except for the fact that this part of Cienega Springs Road was abandoned years ago when SR 95 was moved from Riverside Drive to its current route above Cienega Springs, resulting in the permanent bifurcation of Cienega Springs Road. Ever since the highway opened, Cienega Springs Road has been a dead end on the south/west side of 95. It resumes again as a dirt road on the north/east side of 95 as the route to Nellie E. Saloon (Desert Bar). So what’s up, Parker Live? Why all the construction activity on a dead-end road? Thanks for the great question, Bifurcate. It’s true, Cienega Springs Road is semi-confusing now that it’s been split in half like an unfortunate rattlesnake. Anyway, you’re right; one part of the road is used by many thousands of people every year to take them from Highway 95 to the famous Desert Bar (also known as Billy Malk Mine Road), and the other part runs the much shorter distance from the river road (Business 95) through some residential areas to its end just short of the highway. Truthfully, I wasn’t aware there was any work going on back there. I pass it most days, like thousands of others on Highway 95, and never think about it. But I asked La Paz County Pubic Works Director Tom Simmons about the project, and he told me what was going on. So, Bifurcate, there’s been a lot of red tape and a lengthy process going on. Simmons said the County has been involved because of limitations the system places on individuals in such a situation. He added that the situation is complex because of the history of how the road was bifurcated, Bifurcate, by the highway. Now, Bifurcate, are you curious who the private individual is? Me too. So I found out: It’s none other than prominent Parker realtor Robert Gory! It turns out that Gory had bought an old mine back there years ago, one of many that dot the area landscape (the famous Desert Bar is built on the site of one, too). He had persevered for many, many years with the process of trying to create a right-of-way to access the land, and has now finally secured it. I couldn’t reach Gory when I wrote this Thursday, but his office tells me he’s very happy with having his patience rewarded after all this time. And now, a road to nowhere may finally lead… somewhere. So is there still a spring there?? We used to get water from that spring, maybe in the ‘60’s or 70’s . Road to the desert bar. Road to Desert Bar is off the 95, this is on the old river road. While highway 72 has potholes 4 inches deep and run in lengths of up to 15 to 20 ft. Blown tires, loss of control, rocks in windshields….accidents. If you have an incident file a claim w the county. It’s negligence. LoL wouldn’t you all love to know…. Wasn’t this property recently up for sale? 10k or something. Yes, there is still a spring, pops up every so often. The road led to the Desert Bar, once they put extension of the hwy 95, it became a dead road and you can get Cienega Springs Road from hwy 95. It used to be the same road, but was split by Highway 95 when it was constructed decades ago.